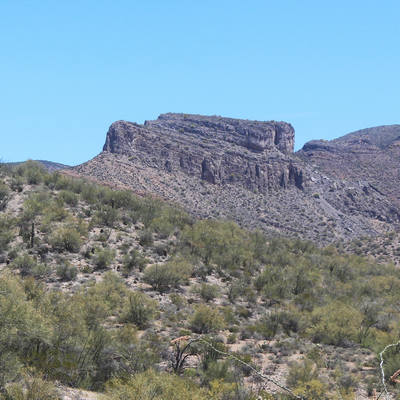 After a hike to the Vanadium and Cowboy Mines in the Dripping Spring Mountains of Central Arizona, I used Google Earth to "fly" over several roads that I had seen in the area. 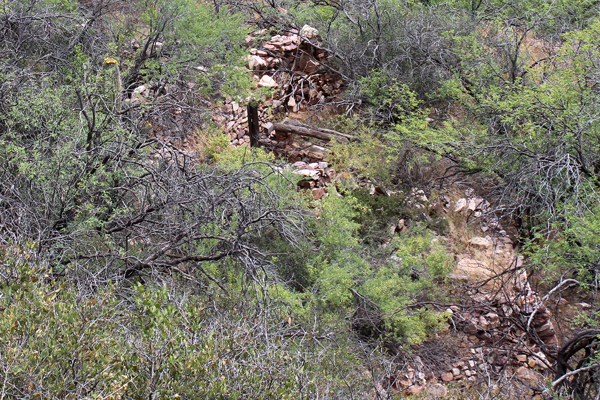 At the end of one of those roads, southwest of the Cowboy Mine, several walls appeared. None of the maps that I have show any human activity at that location. When I asked a friend what he thought about the structures, he said that the arrangement of the walls together with their location reminded him of a place that his dad had taken him to when he was very young. His dad had told him that this was the site of an old Mission! I did not know what to think about that story, but if these walls could be more than just a set of pens or corrals then I was game to go check them out. 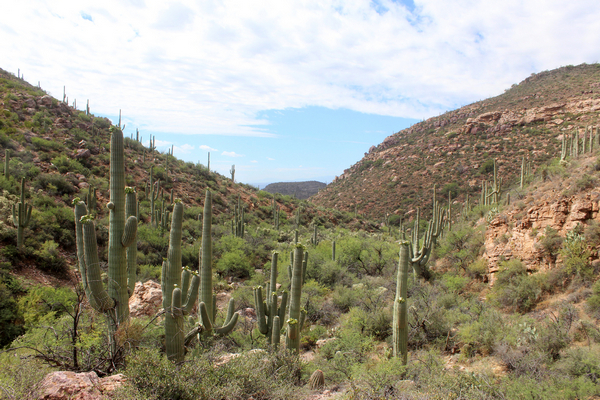 I could have repeated the hike to the Cowboy Mine and then continued on to the ruins, but that would have been a very strenuous 10 mile hike. I looked for another route. 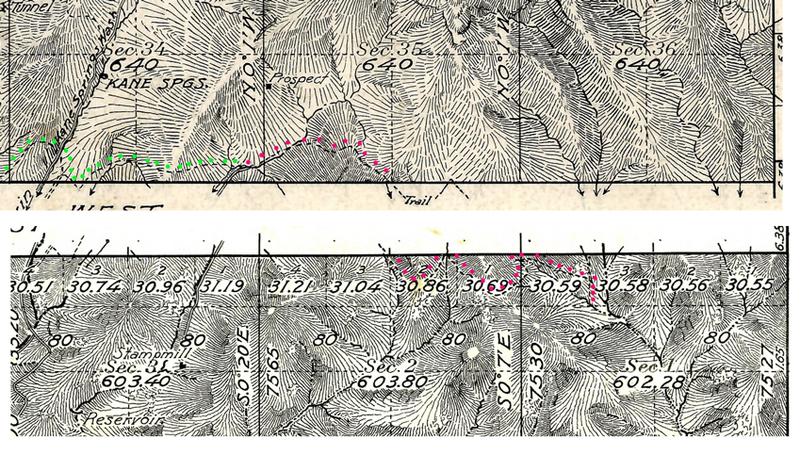 Map study showed that the ruins are in a tributary drainage to Steamboat Wash. That wash runs next to Steamboat Mountain, a prominent peak just north of Kearny. Years ago, I had driven to the base of Steamboat Mountain on a jeep road out of Kearny. If that road were still open, perhaps I could use it to get to the base of the mountain and then walk the wash to the ruins. That became my plan, and in mid May, I put it into action. 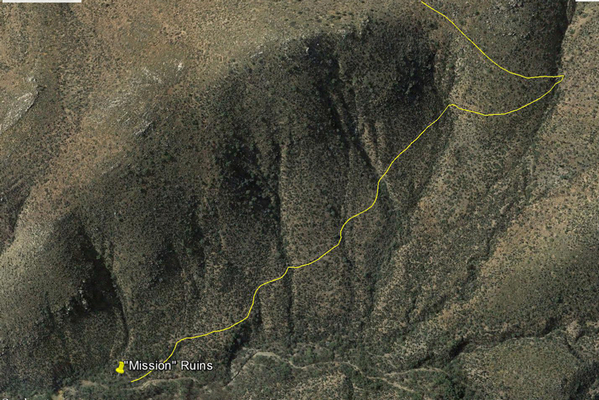 When I got to Kearny, I found that the jeep road that I was looking for is now a part of the "Mescal Mountain OHV Recreation Area". 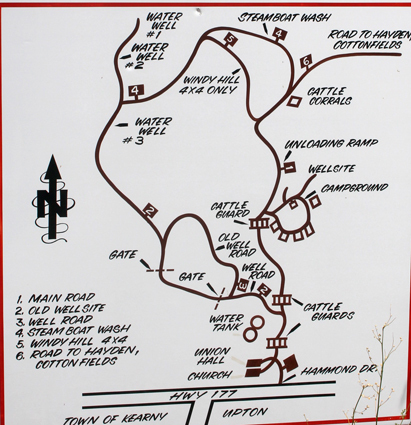 This informational sign, at the junction of Hammond Drive and Highway 177, indicated that the route that I wanted to take was Trail 1, the main road, to Trail 4, the Steamboat Wash Trail. 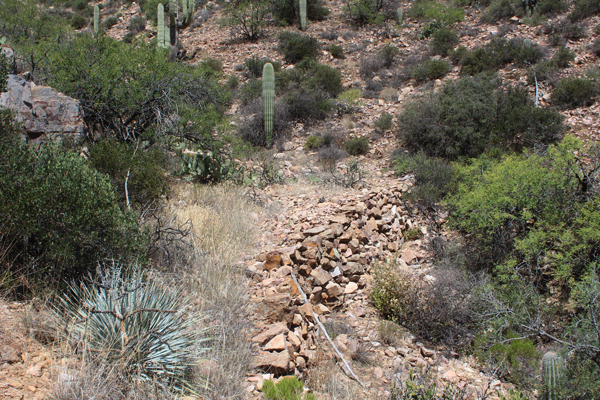 The three mile section of Trail 1 was a bit rocky but did not require four wheel drive. Trail 4 down in the wash was considerably more uneven. It was a little more than a mile across terrain like this to get to the base of the mountain. At the spot where the road crossed Steamboat Wash for the last time, I parked and started my hike up the wash. An eroded spur road served as a trail. In a 1/2 mile, Steamboat Wash took a hard turn to the west. The old road did not go that way. The walk in the wash bottom was no longer a stroll in the park. 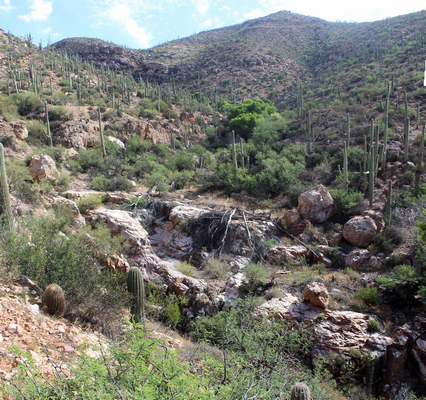 It was a challenge to avoid the thorny brush and many large boulders. The appearance of large cottonwood and willow trees was a neat surprise. They really added to the canyon scenery! It was necessary to exit the canyon floor here to bypass a waterfall. From a distance, it looked to be very oasis like down there in the trees. This view is down the canyon to the southwest towards Steamboat Mountain. At the next rocky section, it seemed easier to bypass the ledges than to take the time to figure out a route through them. Despite the challenges to travel, it was easy to appreciate the scenery. Although it was very pleasant in the shade of the large trees; deadfall, thick brush, and low hanging branches often hindered progress. Walking out along the hillsides was generally easier. This rattlesnake was the only critter that I encountered. Fortunately, he gave a warning signal early and then retreated. In a mile and a half or so, there had been enough elevation gain that only the very top of Steamboat Mountain was visible down the canyon. It was near here that I turned up the side drainage towards the ruins. This rocky outcrop was an obstacle to the walk up the side canyon. I have seen rocky outcrops similar to this associated with large water springs. Was this an old spring mound? When I arrived at the gps waypoint for the walls in the Google Earth image, they were not in sight. This was the view. The structure is a very long and tall retention wall. My first thoughts were who built this and why? The walls in the aerial photo are in the distant brush. I estimated the retaining wall to be approximately 100' long and in places 10' tall. How many thousands of stones had been handled to create this wall? And how many tons of dirt had been put in behind it to create the platform that it supported? Someone wanted this to be a permanent site. What was this place? 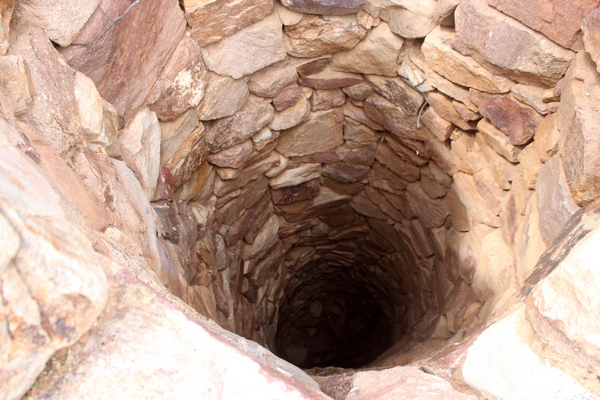 This is the opening to a hand dug well. The well is quite deep. Whoever did the rockwork was very skilled! What had it been like working down there? 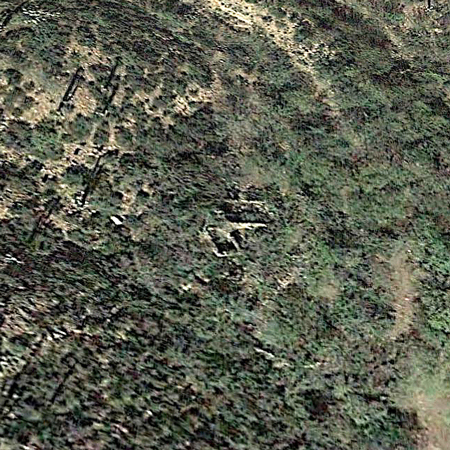 This is the larger structure in the aerial photograph. It appears to have been a dwelling. I had not taken "measurements" of the rooms from Google Earth before the trip. Once back home, GE indicated that this room was approximately 12' x 18'. The window openings seem close to the floor. A large fireplace occupies the west wall. A mud mortar was used to seal the spaces between the stones. Nothing remains of any roofing materials. A window opening in the south wall allows a view of the smaller structure in the aerial photo. There was not a door opening in this wall that allowed direct access to that structure. This is the smaller room. It is approximately 8' x 12'. We are speculating that the wooden lintels may be Arizona Cypress or perhaps Juniper. The wooden piece in the background still shows the marks of the axe that was used to shape it. A barrel cactus and a saguaro cactus now make the south wall of the large room their home. There are other walls and other rooms at this site. The last thing that I wanted to do before leaving the area was to hike up onto the hillside above the ruins and see how the site appeared from there. The view would have been better if there had not been so many leaves on the trees. The positioning of the two rooms with respect to the retaining wall can be seen. While on the hillside I decided to continue on up to the ridgeline and return to my truck by a traverse above the canyon. The views out across the open country were great. This is to the southwest. Steamboat Mountain is in the center of the photo. My truck was parked in the wash near the edge of the cloud shadow. I will say that I am skeptical that the site was once a mission. But if it was not, then what was it? A tremendous amount of effort had been expended in the preparation and construction of this site. My thinking was that this was some sort of hub, an important place. Perhaps this was the headquarters for some early ranching operation? There are modern remnants of that kind of activity there today. A dirt stock tank is adjacent to the site, and there are bits and pieces of modern cowboy equipment scattered about. But private ownership of the site was never attained. There are no patents listed for homestead or stock raising enterprises. I posted several of the photos that I had taken on a Facebook group site whose members are folks who had grown up in the area. These were some of the reactions. The mission story then became associated with other tales of lost church bells and gold church artifacts. 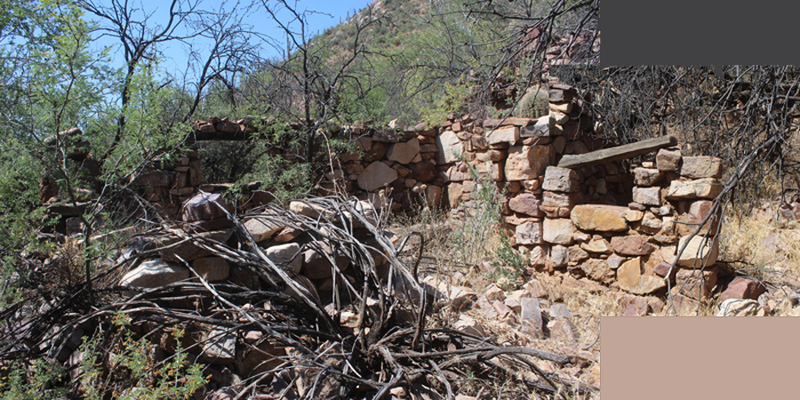 Not one person submitted the idea that the site was an old ranch, mine or homestead. It was suggested that I contact a fellow who is now in his 80's and whose family has ranched the area for many years. I did that. 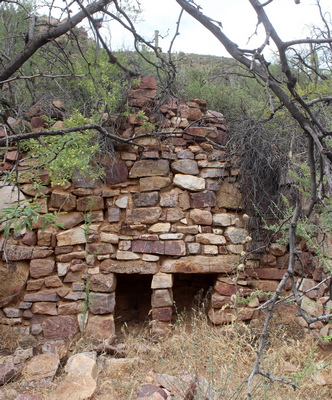 Without any hesitation, he identified the site as the "Old Mission". As he talked about the site, he described an ox cart path that ran from the Dripping Springs Valley to the mission and then on up the hill and onward for several miles to the west. 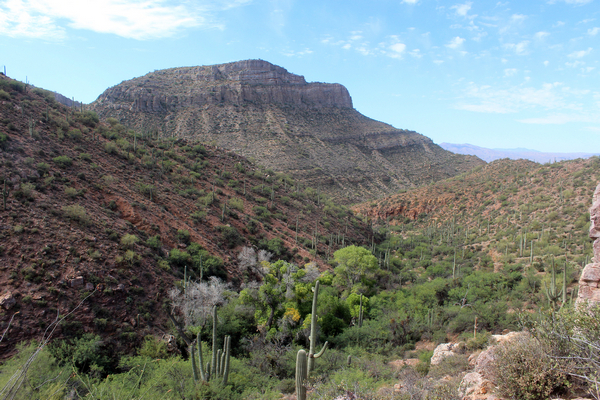 He could not remember which canyon that the path dropped into to get down to the Gila River. That it was too narrow for conventional wagons was the reason that it was described as a cart path. After our conversation, I immediately went to Google Earth to see if there might be any signs of a road or path in the area south of the mission. The yellow line traces what I found. In the switchback there seemed to be some sort of structure. Was that a retaining wall? I could see that the top of the hill where the road broke over could be accessed by hiking up from the end of another of the OHV Roads out of Kearny. I was soon off again on another adventure. This time I drove to the end of the Trail #2. Several water wells belonging to the town of Kearny were passed along the way. It was a steep, rocky, cross-country hike up to the crest of the mountain to where my gps said that I needed to be. After a few minutes of looking, I spotted the old path. As the rancher had described it, the path had been built up slightly from the surrounding terrain and it was pretty narrow. He had told me that he had ridden up the trail the last time in the 90's. As in the preparation of the ruins site, a considerable effort had been expended in the construction of this road. This view back to the skyline shows the trace of the old path. I estimated the width to be approximately 4'. 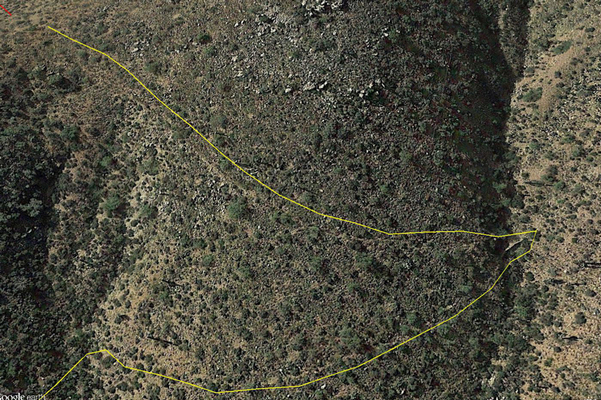 The structure that appeared in the GE image of the switchback was indeed a retaining wall. This photo show how two of them were used in the construction of the turn. The edge of the old path is visible across the hillside. It does not go near the old ruins....it goes right into their midst. 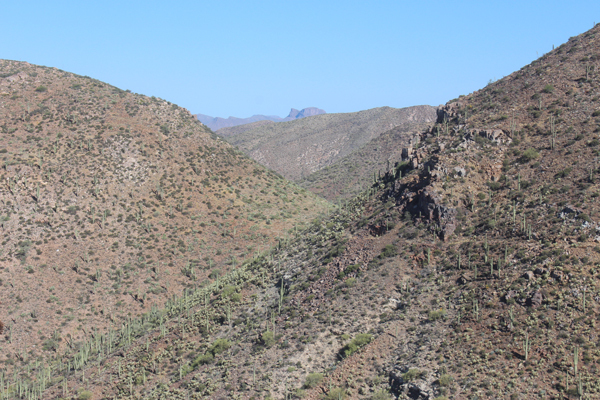 This is a view from the old path across to the more modern road into the ruins from the Dripping Springs Valley. A friend says that he had tried to come from there on his ATV but did not get through. The road was in very bad shape. I had walked a section of that road on my previous trip. There had been zero signs of any traffic. I do not know if this road was constructed on top of the original path or not. This is the end of the path at the ruins. The modern road has not had any vehicular traffic for quite awhile. I returned from this second trip to the ruins by walking the path in reverse. Once back on the skyline, I hiked west a short distance to where Google Earth seemed to show a continuation of the old road. And there it was! This is no minor feature on the landscape. And what was its purpose? Was it constructed as a path across the mountains and the ruins site was a waypoint along the way? Or was it built with that site as its destination? Did ox carts really ever travel this road? I have read several informal histories of the area and no where has there been any mention of the road or any record of any activity in the "mission" area. A little bit of light began to shine on the history of the area when I came across the GLO Township Survey maps. The first surveyors had come through in 1880. But the land around the "mission" site had been declared as "land rough and broken" and had not been surveyed. The township was re-surveyed in 1927. The "mission" site is located, but not identified, in Sec. 1 in the lower right corner of the map. There is no indication of any houses, ranches, mines or other structures in the section. The "cart path/road" does seem to be there. The switchback up the hillside from the ruins is depicted. I have highlighted the trail with red dots. Those extend to the west where the trail intercepts a road coming from a mine in Section 3. The upper GlO Map was surveyed in 1921. Is there a relationship between the mine road and the cart path? Or did the cart path continue to the west along the trail indicated with the green dots? At the other end, the path is shown to end in Section 1. There are no other trails drawn elsewhere in that section or north in Section 36. It appears that the purpose of the path was to get to the ruins area. That area does not appear to have been just a waypoint along the trail. The GLO surveyors identified houses, ranches, mines and other types of property on their maps. What does it mean that there is no identification of any structures in Section 1? Were there no structures, or were the ones that were there already in such a condition that they were not worth noting? As I have time, I will continue to see if I can work out more of the history of this area.